I'm assuming that ballistic solutions are similar?? Barrel life seems to be reported as slightly better with the 6BRA. The Alpha brass is reported to be coming on line in May/June. The first trials of it will hit locally for development/testing in late Feb or March. This was discussed at ShotShow. ADG recently released 7SAUM brass. They were kind enough to send me 5pcs, looks nice! I'll shoot those same 5pcs over and over with some spare bullets/4350 in my 7SAUM. I would like to see at least 6 firings..... Reason why? A couple friends have had had horrible luck with Nosler and Norma 7SAUM brass, 2-3 firings with sane loads. One buddy had the case bodies split after two firings in a "match" chamber with a FL die that doesn't size much. 6BRA barrel #2 30.4/4895/105HVLD/CCI450/2930, shoots great. It's on par with my most accurate Dasher barrel, same velocity with 31.6/4895/105 Hybrid. If you have a moment could you provide me guidance on 6 Dasher dies. Many suggest Whidden. Do you recommend these or others? Bushing or Not? That being said, I'm a huge believer in mandrel dies to set the neck tension. Seater dies, many suggest Forrester Micro Seater. Using Harrel's FL bushing dies for both the Dasher and 6BRA. Harrel's offers several different size FL Dasher dies based on the .200 line. I have enough experience with the Dasher if you can get the .200 number, I'll know which Harrel's die. If you can't get it, Harrel's will ask you to send 2-3 fired cases. Not using my Dasher FL die, glad to loan you mine to get fired cases to Harrel's. Harrel brother are great to deal with. They are old school. Order a die, they'll send it out w/o payment. You receive the die with a invoice, mail them a check. Loaded neck OD .2685, .267 bushing. Forster Micrometer seater. Lot of hub-bub about magazine feeding the Dasher. I've have many thousands of rounds using stock 10rd AICS with the feed lips slightly bent, feeds 100%. No need for the spacer kits. Suggested load with 105's. 31.2-31.8/4895/CCI 450/2920-2980 depending on the barrel. Easy Peasy! Seems like forever since I've shot. Figured I had a 4-5 hour window today before the next snowstorm arrived. The day started nice -- 40 degrees and light breezes -- but I promptly stuck my 4Runner in a snow drift taking steel targets to the range. Fortunately, not my first rodeo, and a few minutes with a grain scoop shovel got me going again. Terrain dictates most of my shooting locations and target locations, which results in shooting more-or-less directly to the east. Great for seeing targets in late-day shooting, but not so much for morning shooting or mid-winter days. So today was an exploratory mission to find a lane or two that pointed northeast, making morning and low-sun shooting days possible. I believe I found one that works. Target distances will be limited to maybe 400 yards, but I'll have something for mid-distance 223 and long-distance 22lr. The weather forecasters were dead on today. While sighting in a scope on older lever action 22lr, a north wind kicked up. A lot. 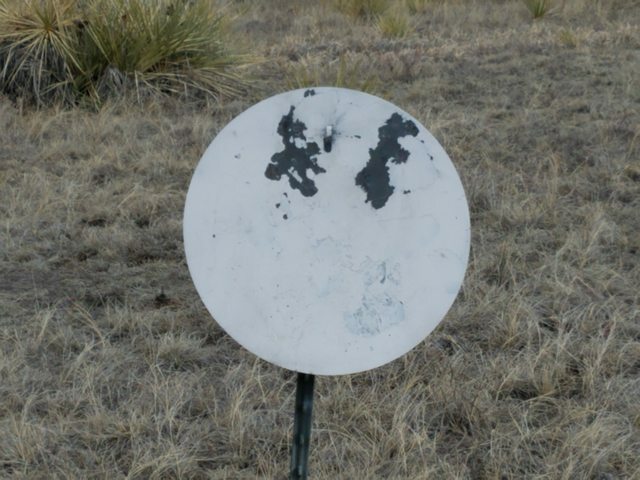 Left-to-right bullet drift at 50 yards varied from .5" to 2.5". OK, time to pull targets. Just as I was packing up the snow arrived. Temps dropped to 25 F, winds steadily increased to 25-ish, with gusts to 30 and 35mph. Time to go home and turn up the heater. I'm convinced.... It Cheating at all levels. Was fireforming 6 Dasher brass on a new barrel. Did nothing special - Lapua 6BR Brass, 30gr Varget, CCI 450 Primer, Jammed 0.030 into the lands. It went single round center hits to 1200yds without a miss.... Damn that's easy. Started out at 2650fps and picked up to 2700 by the end of the 100rds I had loaded. Now I see why the 6mm family is dominating the PRS scene. No recoil, super accurate, easy reloading. What's not to like?? In previous matches I grabbed rifle stock certificates from the prize tables. 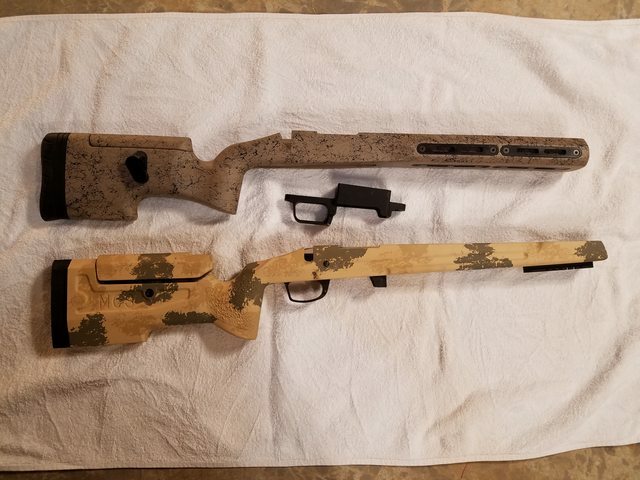 It's been a really long wait, and both stocks have arrived. In the following pictures the upper & darker stock is a Grayboe Ridgeback, the lower and lighter-colored stock is a Manners PRS-1. IIRC, Grayboe is owned by Jeff McMillan, who is part of the McMillan stocks family. Jeff split and started his Grayboe. The Grayboe Ridgeback has a similar feel to McMillan and Manners stocks, however it is designed to be sold at a noticeably lower price point. The Ridgeback shown here has Grayboe bottom metal -- which works for AICS magazines -- but the bottom metal has not yet been installed. The Ridgeback comes with MLOK rails on the stock, and a small bubble level built into the stock. The bubble level is located just aft of the opening for the bolt. I ordered the Manners with a mini-chasis. The Grayboe will be bedded. Other options on the Manners include a rail under the front end of the stock and QD sling attachments along the left side. Using my bathroom scale, the Grayboe weighs 4.2 pounds and the Manners weighs 3.8 pounds. There's something about the Manners that makes it feel a little nicer, but honestly the Grayboe seems really close in quality. The Grayboe will be used as a 223 trainer. I have the barrel in hand -- a Proof Research I won. I ordered a Defiance standard-length 223-faced bolt, with DLC coating. The Defiance action should arrive in late summer. I plan on using a Triggertech standard trigger and Accurate mags. The Manners will be used as a 22lr trainer. I have a Remington 40x rifle in hand -- of which only the action and trigger will be used in the final rifle. Jelrod1 will do his magic in converting the 40x to a repeater, using 10-round 22lr mags that mimic AICS center-fire mags. I have a take-down Thunderbeast suppressor on order for this rifle. This has been a long process, and I still have many months to go before it's all done. I just received my PRS 1 w/mini chassis for my Vudoo V-22. I should have a second one for my new 6BRA here in a couple weeks. I've come full circle from a T4A to several chassis, and now back to a more traditional set up with two PRS 1's. My Vudoo came with a Grayboe. For the price they're great stocks. What's your plans for glass on the new builds? The Manners .22lr will have a Nightforce ATACR 7-35x. I hope it holds up under the rifle's recoil -- Doh! Yeah, a lot of optic for a lowly .22, but I want the ATACR's close focusing capabilities. I bought the scope during a Christmas sale and it's sitting in its box in my basement. I figure this rifle will still be shooting right up to when I'm gumming jello in a senior center. The Grayboe Remy .223 has less grandiose optics at this time. I have an old sfp NF NXS 5.5-22x that's sitting around. The NXS was on a AR-10, but I finally got around to upgrading the AR-10 with a ffp optic last year. I'm in no mood to buy more glass for awhile, so the NXS will do for now. Or better stated, the NXS will do 5-6 months from now, when the Defiance action arrives. The 7-35 is an excellent optic. I own a couple, but neither reside on my 22LR. It's a popular choice for a 22LR becuase of the 10M parallax. I want another but have some other priorities at the moment. Looking forward to some pictures of the finished builds. Fritz I own two of the 7-35 F1's with Tremor3 reticles. Getting the parallax adjusted correctly almost drove me insane. As you know it's a combination of adjusting the ocular as well as the parallax. Another shooter who owned one suggested turning on the illuminated reticle in a dark room and adjusting the ocular focus and getting that set up correctly first. I tried this last night. Went prone in one room, pointed the rifle down a hallway. Lit up a white wall on the right, with a dark room on the left. Alternated between mid-level green illumination for the dark room and no illumination for the white wall. It's amazing that my ocular focus was so far off. I don't think I've done that with a new scope in many, many years. Thanks for the suggestion. I'm hoping that the weather cooperates this weekend so I can put a few rounds through this rifle. Parallax will certainly be better now. I spent a few frustrating evenings with my first 7-35 and was about to cut it loose before someone suggested using that method. It's a fantastic scope once you get in dialed in correctly. Fritz/Swage, expound on this technique please. I set my NF 5x25F1 up by setting parallax to infinity then looking at a clear sky and making the reticle as crisp as I could get it using the ocular. Sounds like it needs to be a combination of this and adjustments made with the reticle on looking in a dark room. Am I understanding this correctly? I set my NF 5x25F1 up by setting parallax to infinity then looking at a clear sky and making the reticle as crisp as I could get it using the ocular. Yep, that's the way to do it. And it's how I've set every scope so far, but somehow I didn't do it very well this time. The illuminated reticle and a dark room or background is just another tool to use for setting the scope. As you know it's a combination of adjusting the ocular as well as the parallax. I have been puzzling over this statement. Getting the reticle in proper sharp focus has always been the first thing I do after mounting a new scope, and I too have discovered that focusing on an illuminated reticle in the dark seems to work well (sometimes). One thing that’s critical for me is to find the proper focus when my pupil is widely dilated. That helps ensure that the greater depth of field of my vision due to a constricted pupil doesn’t compensate for improper focus. Once I have the reticle focused, then I have to go through the usual process of setting the parallax properly: image in sharp focus, moving my head to look through different parts of the eyepiece, and all that. But is there something different about the process for Nightforce scopes? Is there some sort of back and forthing required to get the reticle focused along with the parallax setting? Or am I misunderstanding something? For some reason the NF 7-35 is very finicky and the ocular has IMHO way too much range of adjustment. You could turn it several full turns and not notice any change. Typically I do the same as you did or use a white wall as a backdrop, but it didn't offer enough contrast. I tried for two days after work to get the ocular set so I could dial the scope and be parallax free without success. Then someone on another forum mentioned the method of using the illumination and I was able to get the contrast I needed. Thanks, swage, now I understand what you're referring to. I will shoot in the Nightforce Q-Creek ELR match this year. My 6.5CM will be under gunned for the distances. It was time to see if the Hornady 147 ELD ammo performs better than the 140 ELD that I normally use. First up, MV testing. I get 2820 fps with my 140s. The 147s produced 2755 fps -- reasonable, but I had hoped for a little more. SD of 17.7 was a little higher than I wanted to see, as the 140s tend to be in the ballpark of 9 to 12, depending on the box. Shooting time was a little short, therefore I passed on the 100 yard groups for accuracy testing. I measured MV with a Magnetospeed while shooting at 450 yard plate. I measured vertical variation only, as winds were 5-15 mph from 1-2 o'clock. Winds cycled up and down from shot to shot. In two separate 5-round groups, vertical variation was 2" and 2-3/8" for the 147s. That works for me. On to 690 yards with the 147s. The first four rounds were in a tight 3-3/4" vertical. I got all excited and yanked #5 high, making the total vertical 6". I knew I yanked it high, which is my normal error direction. This usually occurs when I'm tired -- I put too much pressure on the stock with my cheek weld, I relax my grip on the rear bag, and I see the reticle jump up during recoil. I tried 609 yards with my regual 140s for a benchmark. First four rounds in a tight 3" vertical. A very close clap of thunder sounded just as I broke shot #5, and I pushed the shot high -- now total vertical of 5". Chambered another round and shot #6 landed in the middle of shots 1-4. Bottom line -- the 147 ELD ammo appears to be just as accurate as the 140s in my rifle. Actual elevations tracked well against the JBM calculations I ran this evening. And the 147s sure seem to be less affected by crosswinds. I will order some more boxes of 147 ELD and test them at my longer distances -- 1000 to 1300 yards.